The Meditative Mind describes a wide range of paths towards spiritual transformation -- Hindu, Buddhist, Sufi, Jewish, Christian, Transcendental Meditation, Tantric, Kundalini Yoga, Tibetan Buddhist, Zen, and those developed by Gurdjieff and Krishnamurti. For the beginning meditator, the book provides a unique overview of the different kinds of meditation and introduces the reader to the basic elements of their practice. For the experienced meditator, author Daniel Goleman explores the distinct levels of consciousness developed as a result of long-term application. In this revised edition of a classic work, Goleman has added several new essays on meditation and psychotherapy, the consequences to health of meditative practice, and the differences between Eastern and Western psychologies. The book also provides instructions on how to sit, walk, and eat with a meditative mind. Daniel Goleman, Ph.D., writes on behavioral science issues for The New York Times and is former Senior Editor at Psychology Today. Dr. Goleman spent two years in the Far East studying with meditation masters and has taught at Harvard University. He is the author of Vital Lies, Simplet Truths : The Psychology of Self Deception. 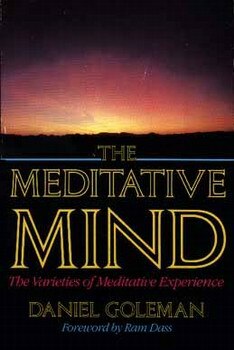 "I highly recommend The Meditative Mind to begining and long-term meditators because the material is timeless and profound. The detailed description of meditation traditions from East and West points out similarities and differences. By its thoroughness, this book paints a well-rounded picture of meditation and for this reason is the best book in its category." "This is a truly fine book for spiritual seekers to sort out and understand the supermarket of spiritual practices now available. Goleman writes with great clarity and depth of understanding."